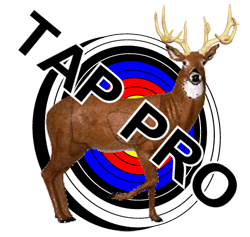 The National Field Archery Association (NFAA) has an indoor competition that dates back to 1977. While most indoor archery takes place in the United States, competitions attract archers from all around the world. There are several types of rounds used for indoor archery, one of which is the NFAA 300 round. Let’s talk about what that means. In the NFAA 300 round, each archer has the potential to score 300 points (hence the name). Archers shoot five arrows during a four-minute end. The round consists of 12 ends. That means each archer steps up to the firing line 12 times, shooting five arrows within four minutes each time. Since this is an indoor competition, the range is typically set at 20 yards. However, NFAA Cubs shoot at 10 yards. NFAA Cubs are archers under 12 years of age. What Targets Are Used for the NFAA 300 Round? This indoor round allows the archer to choose between a single-spot 40cm target and a five-spot 40cm target. Each target face is laid out differently. The single-spot target face is dull blue with a white center spot 8cm in diameter with a 4cm X-ring. Other rings, from inside to outside, are 16cm, 24cm, 32cm, and 40cm in diameter. On the other hand, the five-spot target face consists of five 16cm spots on a single 40cm screened blue surface. The X-ring is 4cm in diameter, as with the single-spot target face. The center spot is 8cm in diameter, and the two outer rings are 8cm in diameter each. When shooting at the five-spot target, archers are allowed to aim their arrows at the various spots in any order. They may shoot as many arrows into a particular spot as they wish, not to exceed five arrows per end. How Is the NFAA 300 Scored? Each arrow is worth up to five points. For the single-spot target face, scores of one through five are possible. The rings, from inside the target face to outside, are called the X-ring, the center spot, the 4-ring, the 3-ring, the 2-ring, and the 1-ring. As you might expect, the rings are labeled for their point values. The X-ring and center spot are worth five points, with scores for the other rings ranging from four down to one. See the illustration below for clarification, if that’s confusing to you. 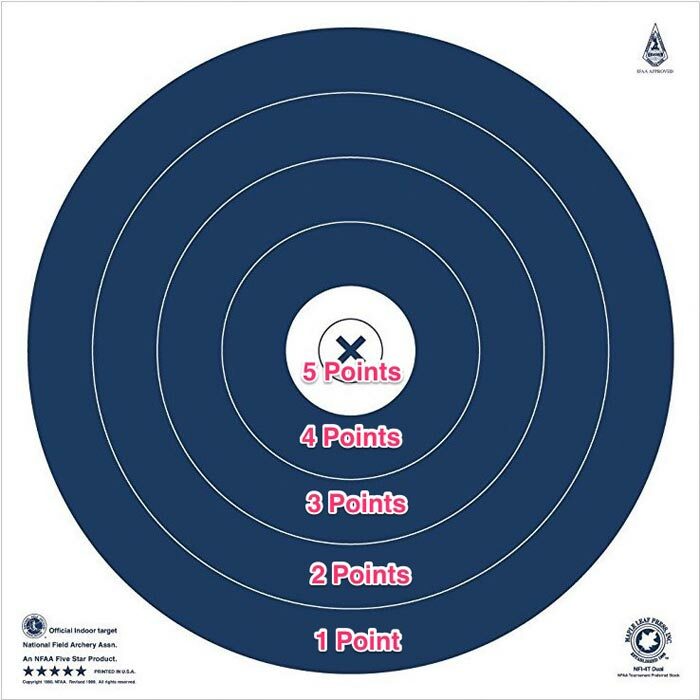 On the five-spot target face, the X-ring and center spot are worth five points. The outer rings are worth four points. There are no one-, two-, or three-point rings on this target face. Any arrows that are shot outside of the rings will be scored at zero points. If the arrow shaft touches the line, it is considered the next-highest scoring value. Bounce-outs or pass-throughs will be reshot. If an arrow’s nock goes through the target face, it’s considered a pass-through and can be reshot. Arrows will not be pushed back through the target. On both styles of target face, X-rings are counted and used as tie breakers. They are considered part of the official score. Basically, you shoot your five arrows in four minutes, and then score the end. If you don’t shoot all of your five arrows in time, you lose points. Your highest-scoring arrow (or arrows equaling the number of arrows you failed to shoot in time) will be deducted from your score. Arrows cannot be touched, let alone pulled out, until scoring is complete for everyone. How Does an End Go? The range is set up for two lines of archers, with four targets per lane. 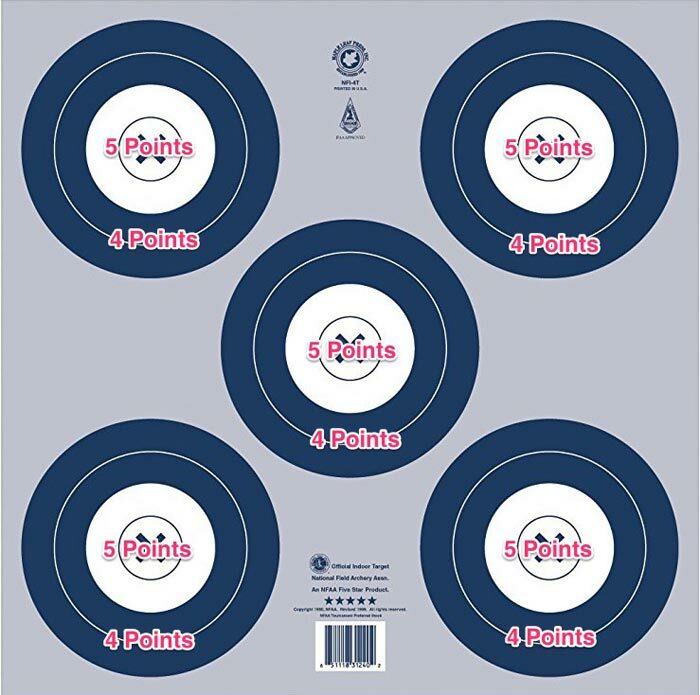 The targets are laid out with two on top and two on the bottom. Archers assigned to the bottom two targets shoot first. After their four-minute end is over, the archers assigned to the top two targets have their turn. Once both lines have shot their ends, scores are tallied. After six ends of scoring, archers will switch from bottom to top, and top to bottom. Archers up for their end must stand straddling the shooting line or distance marker, and follow all voice and whistle commands. Any arrow that passes the shooting line by more than 10 feet is considered a shot arrow. What Kind of Bow Can I Use for an NFAA 300 Round? A conventional bow of any type may be used provided it subscribes to the accepted principal and meaning of the word “bow” as used in archery competition, i.e., an instrument consisting of a handle (grip) riser and two flexible limbs, each ending in a tip with a string nock. The bow is braced for use by a single bowstring attached directly between the two string nocks only. The basic design must include a handle riser (grip) and flexible limbs. The total arrow propelling energy must be derived from a flexing of the materials used to construct the limbs. Weight reduction factor is of no consequence. Bows that develop any portion of the arrow’s propelling energy from sources other than the limbs shall not be allowed. The cables of the compound bow shall be considered as part of the string, and all applicable string rules (other than color requirements) apply. NFAA’s standard guidelines on bows applies, meaning the bow cannot have a draw weight of more than 80 pounds. It also cannot propel the arrow faster than 300 FPS, plus or minus three percent. 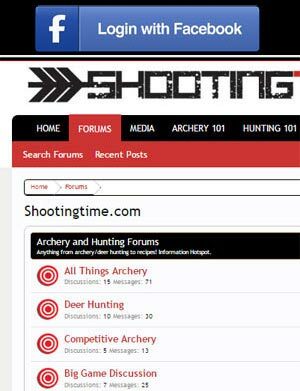 It’s worth noting that any device that would allow the mass weight or draw weight of the bow to be relieved from either or both arms isn’t allowed in NFAA competitions of any sort. NFAA’s indoor competitions are a fantastic way to enjoy the sport even when the weather precludes target shooting outdoors. Some of the realism of lost arrows is lost in an indoor range, but it’s still a terrific way to keep your shooting arm in shape and your aim true. For more information about NFAA indoor competitions near you, check with your local affiliated archery club or the NFAA calendar.